No matter whether the weather is freezing cold or sweltering hot, my family loves soup! This delicious, robust-flavored cabbage soup is always a favorite! 1. In a Dutch oven, sauté the onion and celery in butter until tender but not brown. Stir in the flour until mixture is smooth; add the broth and cabbage. Cook and stir until cabbage is tender and broth is thickened; about 12 minutes. 2. Add the sausage, parsley, pepper, garlic powder and onion powder; cover and cook an additional 5 minutes. Makes 6 servings. Cornbread muffins would go great with this soup! 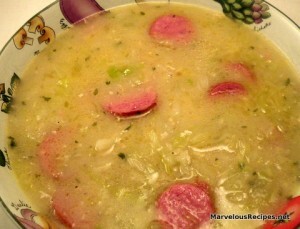 I’ve never heard of kielbasa with cabbage soup, but I bet it’s yummy! I’ll try this one out when the weather gets cooler.